It’s hot out right now. Like: “melt into a puddle with whatever remaining liquid is left in your poor dehydrated body” hot out. San Antonio has a long growing season: 280 days. Our summers are included in the 280 days but I’m not sure that’s very fair. I can get peppers, okra and eggplants through our summer but but I need to water each plant every other day. Although I enjoy having these veggies I don’t want to be out in the yard in 100+ degree days sweating myself into a puddle if I don’t have to. 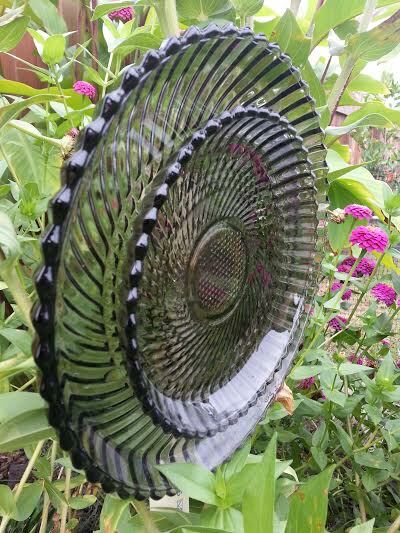 So to celebrate and beautify my garden (without actually being out in the heat gardening) I have a great project: glass garden flowers!!!! Okay, I know glass and the great outdoors don’t seem like a good match but they can be. 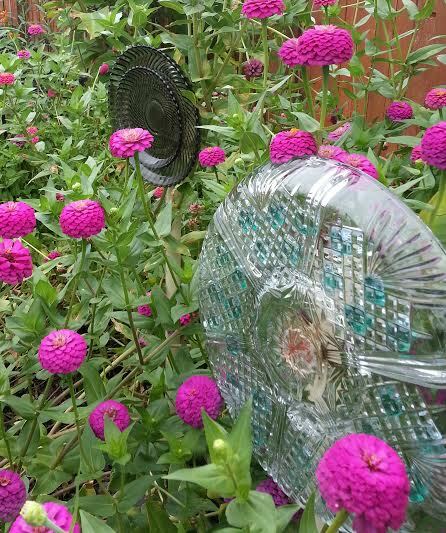 I’m going to teach you how to add a little recycled glass glamor to your yard. These are the stand-ins in my garden before my flowers take off in the spring and they are pretty enough to command attention even though they are located within one of my big patches of beautiful zinnias. I have seen drilled glass flowers. I am too lazy to deal with that. Mine are glued. I like mine glued. Very fast, very simple, plus: I used very heavy glass serving dishes, not thin porcelain plates like most people do. Glue is the way to go! There were a few things I learned from reading online and the rest I did from a few attempts on my own. I’ve seen bell hangers used for glass flowers. Since that seemed to be what the majority of online posts have used I figured I’d go ahead and rely on their experience. The only bell hangers I have found are at Lowe’s in the plumbing department. (Don’t bother with Home Depot. They don’t carry them. However, you can certainly try other hardware stores in your area.) If you don’t have a Lowe’s near you can find them online. They aren’t cheap but they work. These are bell hangers. They come in different sizes for different diameter pipes. Make sure you have all of your supplies matched up before you check out. Go ahead and remove the screws. You won’t need them if you are gluing. I thought about using something other than bell hangers, but I was already at the store and wasn’t interested in wandering the isles coming up with my own idea. The main issue I have with the bell hangers is that they only have a thin circular rim to attach to the plate. Something flat would probably work better, giving the glue more area to adhere to between the plate and the attachment piece. In the absence of my own brilliant answer to this shortcoming: I will admit from my own experience the bell hangers do work. I bought a contractor pack because I plan to make a bunch of these. 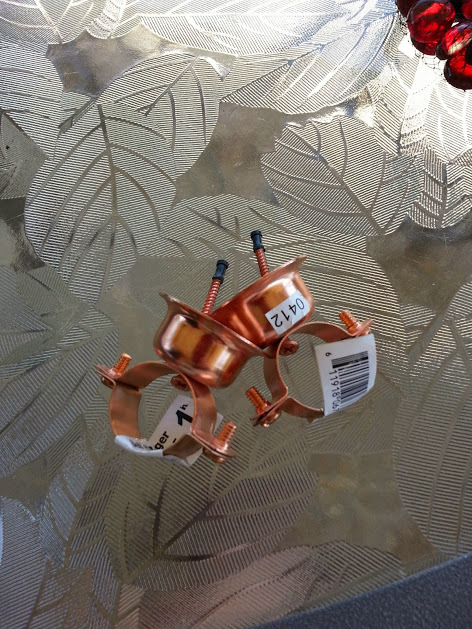 Here’s a link for the pricing: http://www.lowes.com/Search=bell+hangers?storeId=10151&langId=-1&catalogId=10051&N=0&newSearch=true&Ntt=bell+hangers#! Looking for rebar? You are in the right section of the hardware store if it looks like this. 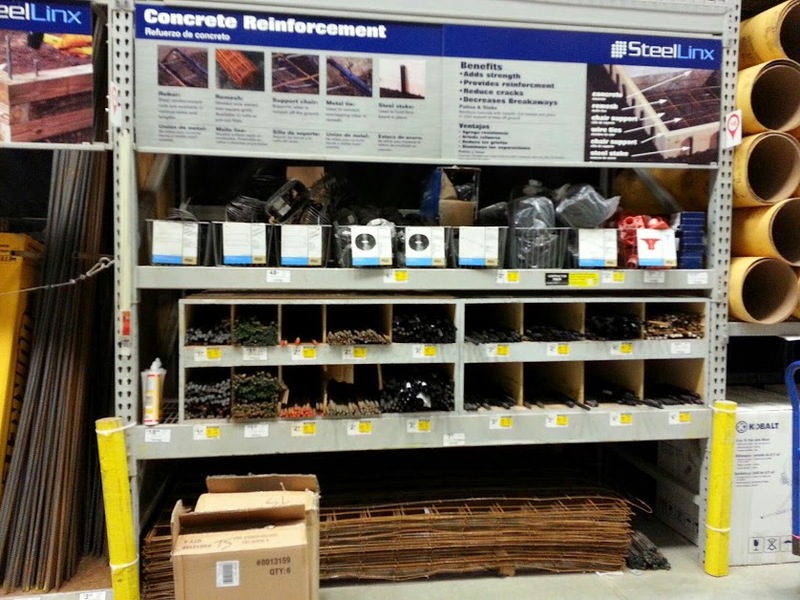 Those boxes on the shelves are full of rebar. Pick something thick and long. Get the same number of rebar as you have plans to make finished glass flowers. You will use the rebar to run into the ground as the base/support and you will place the pvc pipe over it. 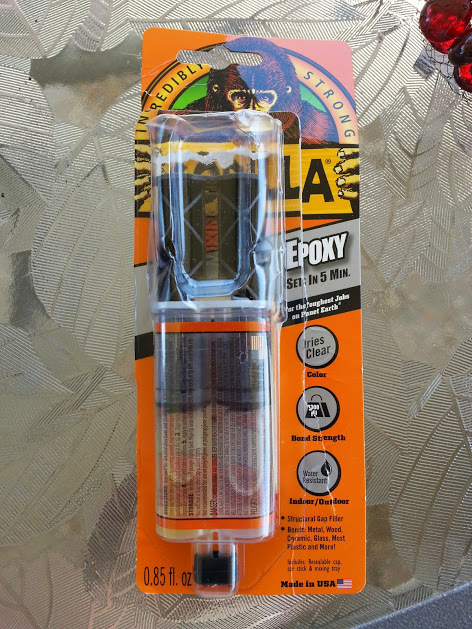 You will also need some epoxy gorilla glue. I have no idea if anything else will work. This is the only glue I have used for this project. The other thing you can use to decorate your flowers are glass beads or stones from a craft store. These are in the floral section of hobby/craft stores. Hold them up to the lights in the store. If they are too dark: pass them up. If they shimmer beautifully in the light, head to the checkout! I was sure the dark red would look nice in the sunlight. They were too dark and not evenly colored. I went with a bag of blue and a bag of green. 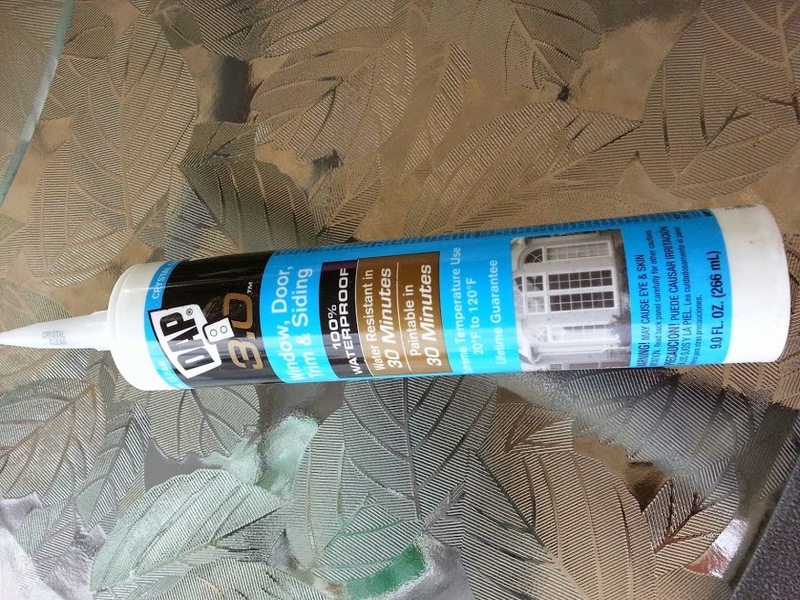 I have used high heat clear “window, door, trim and siding” silicone glue (the high heat designation will be listed on the side in the fine print) to put them on and also gorilla glue. They both work for this application. The silicone glue is much messier and will require gloves. You will also need mineral spirits to clean up the silicone glue. I recommend sticking to epoxy for the whole project. We got a box of medical gloves from our pediatrician and I’m hooked! I use them to protect my hands during any messy chore/craft and this project was no different. They’re really handy to have around and you can bet I’ll be ordering another box when this one runs out! 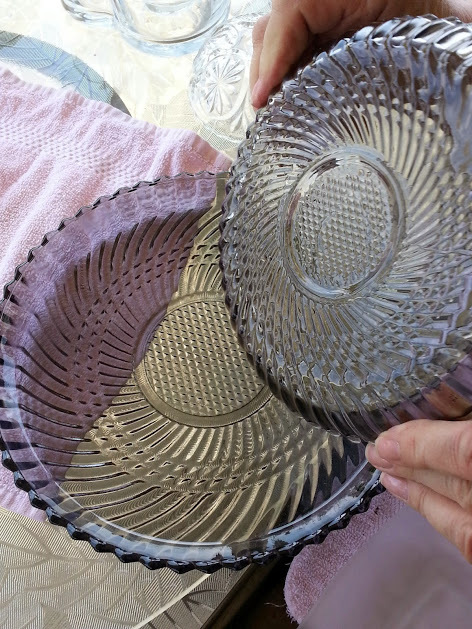 Two very decorative pressed glass plates that created a really cool effect when put together. 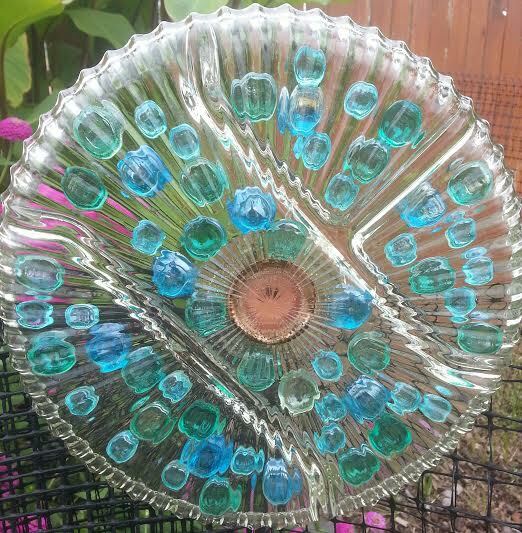 This is a great use for all of those pretty stamped glass plates your great grandmother would have collected. Fortunately, if you can’t bring yourself to mess up your own antique plates there are always a bunch of them at thrift shops! Look for lighter weight plates if you want to do several layers. (I did have a failure. Don’t use frosted glass on a side you will glue. It looked horrible. The lopsided glued area was clear and the rest was frosted. I’m still trying to find a solution for that one.) 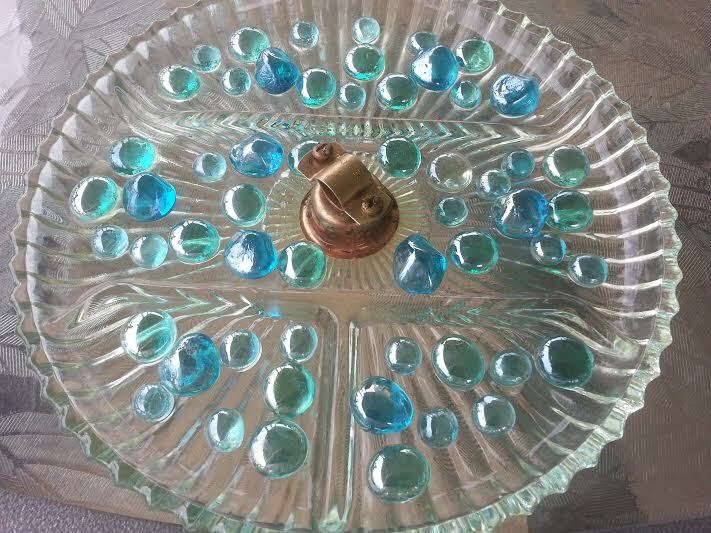 If you just want one plate with glass stones glued to them like the ones above and below, know that those glass stones will add quite a bit of weight on their own. I think the stones look better on the back of the plate rather than the front. You also should thoroughly wash your plates before starting to remove any film or dirt that will affect the adhesive. I ran mine though our dishwasher which uses a separate spotting/rinse agent in it. This was very heavy with the thickness of the plate and the glue, glass beads and the bell ring. It is not the one that dropped. I think if you use a textured plate: try and use the flat side for the bell ring attachment point. I believe the ridges in the other set of plates is why that flower dropped. I just went back and doubled the glue to fix it. All three flowers are still holding. If you really like the look of something heavy, you may still be able to use it. Just make sure you use a couple of layers of glue. I didn’t think what I used would hold, but I have been pleasantly surprised by the strength of gorilla glue epoxy. Look for the highest psi rated, clear epoxy glue you can find. Squeeze the two sides of the epoxy glue into the plastic mixing plate that comes in the package. Thoroughly mix it together with the enclosed stick and immediately place it on the bell hanger rim, both inside and out. Do not wait long or it will begin to set and you’ll have to start over with new glue. Use the stick that comes with the glue to smear it around the bell hanger and up the sides. Wait the recommended time for it to cure. Once it is completely cured add a second layer around the plate and up the sides of the bell hanger. Again: wait the recommended time for each layer to cure. 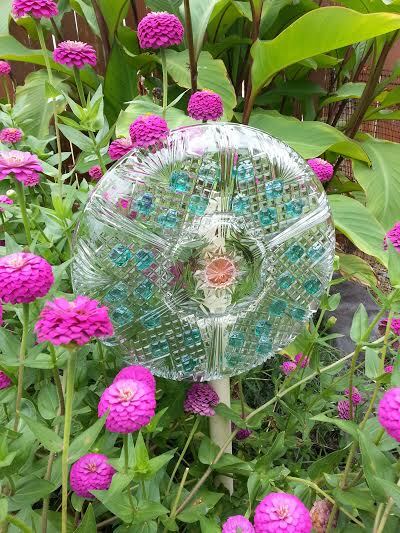 Look around your yard and find the spot you want to add a glass flower. Don’t place your glass flower over something hard like stone or concrete. I had one of my assembled flowers drop (the gray set above). It bounced off of the soil below it and wasn’t damaged. I just popped some of the old glue off and used a few more layers of glue to repair it. I put it right back up once the glue dried. If you use thicker glass and it falls onto the surrounding soil, it may not break as easily as a very thin piece would. As you can see the real flowers in this photo are from this spring (2014). I waited until the fall to recommend my methods. These instructions worked for me. The completed glass flowers I made this spring still look great and are still holding strong! Once you find your spot: drive your rebar into the ground with a hammer or mallet like you see in the above photo. 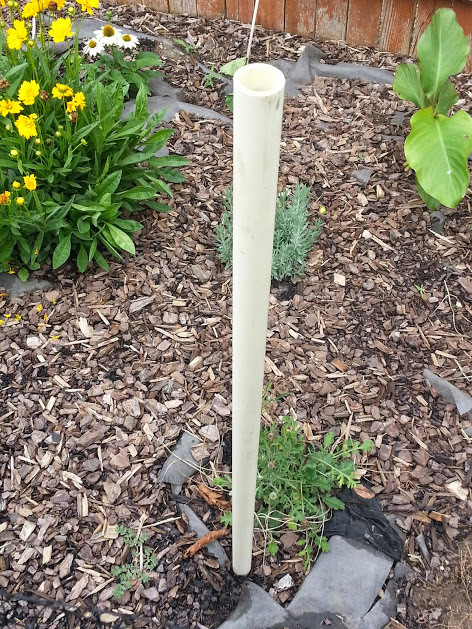 It needs to be fairly deep to support the weight of the flower and whatever wind hits it, but needs to come up close to the top of the pvc pipe so the pvc doesn’t bend and break from the weight. Put the long piece of pvc pipe on the ground next to the rebar and mark how tall you want the pipe to be. Cut your pipe to the length you measured. You don’t have to be exact since the bell clamp is adjustable. I recommend placing the cut side down although, it probably won’t really matter since the glass plate will cover that end. 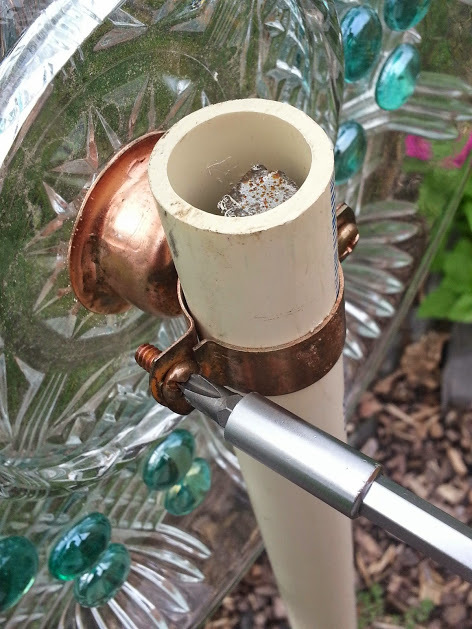 Take the assembled glass flower and place it and the attached pvc pipe over the rebar. Slide the flower up or down to make sure the glass and pvc is supported by the rebar. (The pvc does not need to fit tightly over the rebar. The rebar just serves as additional support for the pipe.) The pvc will probably be stamped. I just turned the printed area towards the back of the flowerbed. The outside part of the clamp opens up and can be adjusted without removing the entire back of the bell clamp. It has a u shaped area to support the screw. Hang the plate with the open area of the u shaped area up. This will allow the screw to be supported underneath by the outside of the clamp. Tighten the screw down with a screwdriver. 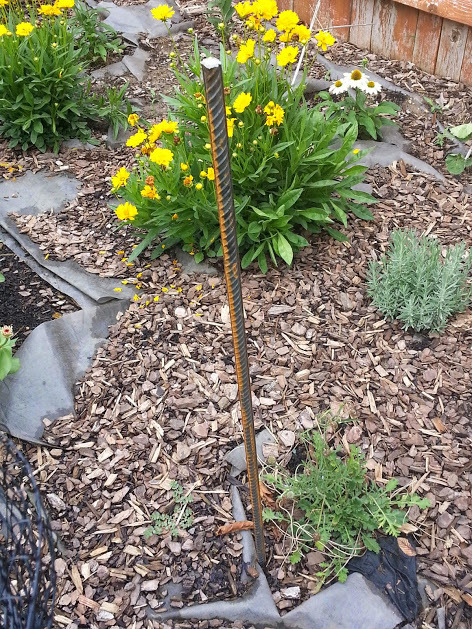 Using pvc pipe over rebar makes the flower quickly removable by sliding the whole assembly off of the rebar. Just grab the plate and pvc pipe together and lift it up and off of the rebar. When you have storms with high winds or hail and for when your winter dips below freezing (we don’t see much of that down here!) pull the whole assembly off the rebar and store it in a protected area. When it’s time to put it back outside just slide it back over the rebar. It also makes it easy to work on your flower if you need to do repairs. I don’t notice the pipe and I don’t recommend painting it because it would eventually peel. My flowers have made it from February to September. One needed repair but hasn’t had an issue since I used two layers of epoxy on it. Now you have the basic instructions for whatever removable glass art flowers you decide you’d like to see in your flower beds. I have totally enjoyed mine. I think the next few I make I’ll try some pretty china from the local thrift shop, just for variety. If you use my instructions and decide to post your work, please link back to the instructions on my site. Thanks! Very pretty and your instructions are very helpful. 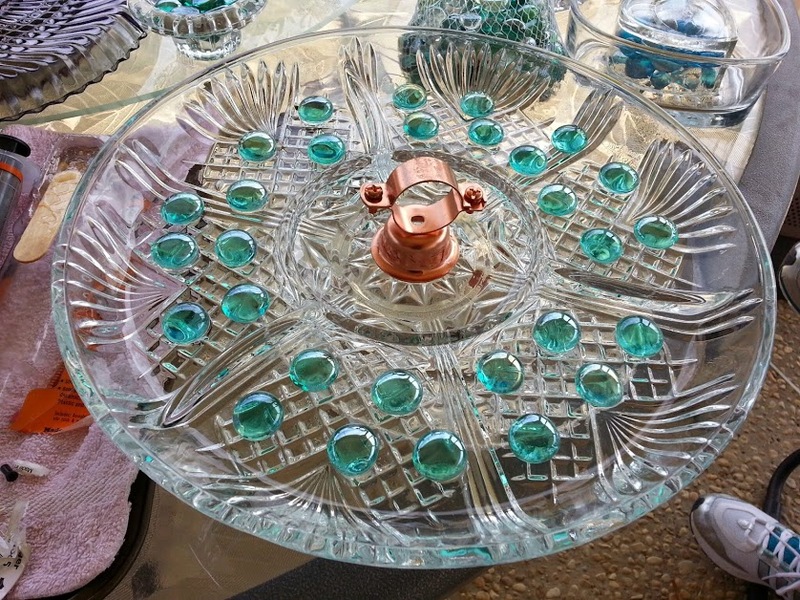 I tried a glass birdbath creation but the glue I used came apart. Thanks. You’re welcome! I hope it works with epoxy. Thanks for coming by. I appreciate it! Pretty! 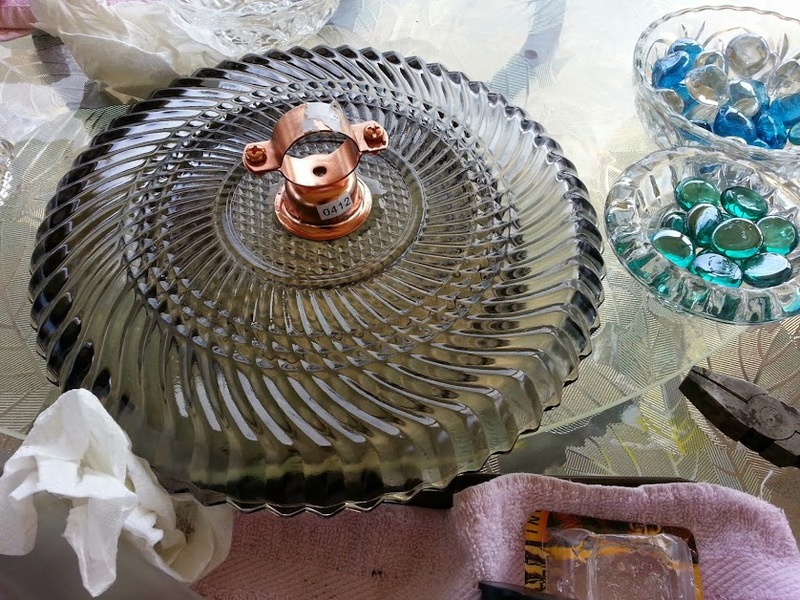 I am collecting bits and pieces at antique shops of various metal “pretties”. I am planning to put up a couple of wind chimes in my veggie garden to keep wild critters from sharing the produce. I will send you a picture when I get to that project and let you know how it works. I have read that foil around the base of plants confuses many bugs that would otherwise infest the plant. I wonder if the reflective qualities of these would help do that as well. Even if they didn’t, it is nice to see them before and after the real plants bloom. Now I need a good way to keep raccoons and skunks out of the yard. It’s the time of year that they are invading prior to winter! I swear by nematodes. I’ve had almost 0 bug problems this year. Fabulous article! Thanks for the share! Thanks for reblogging! I appreciate it. You are most welcome. I love the post! Awesome! I really want to make some of those! They’re really fun. I’m glad you stopped by! I appreciate the visit. beautiful glass flowers! 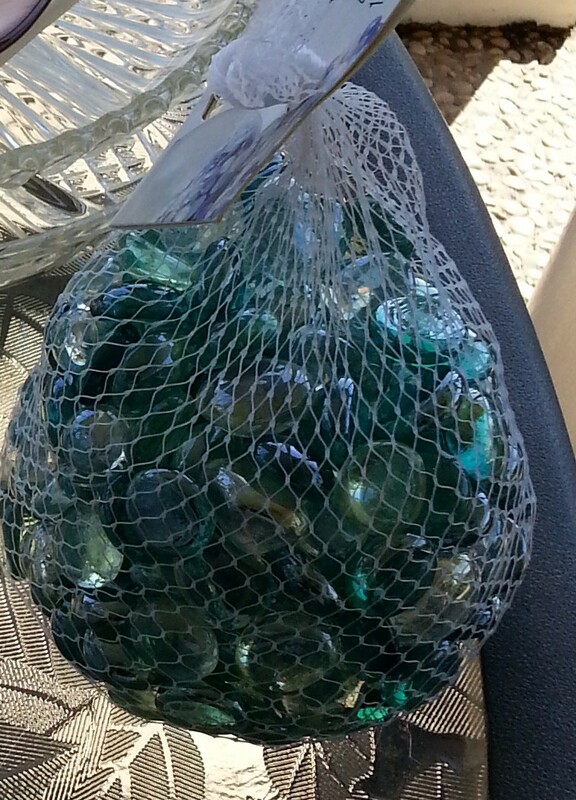 I have a blue bottle tree, but have not thought about glass flower. Thanks for coming by! I appreciate the visit. I hope you make some. They’re really fun! How did you know I want these??? 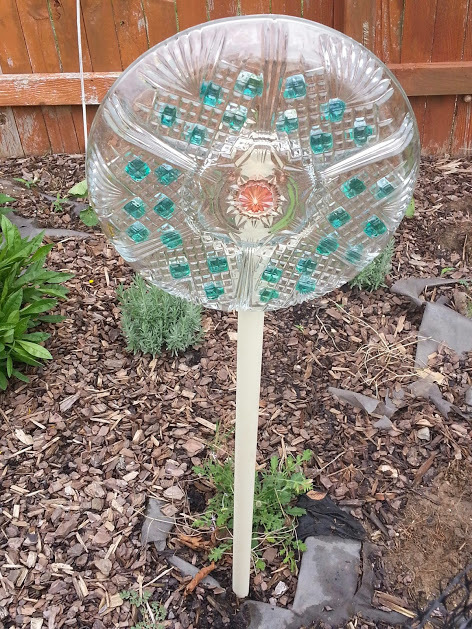 🙂 I’m always on the look out for good yard art, and recycled glass flowers seem like a great option. Thanks for your great instructions. You’re very welcome! I’m glad you like these. They are fun! Wow, these are really pretty and creative — thanks for this info! You are very welcome! They are worth it. It’s a really rewarding and quick project. Thanks for coming by. I appreciate the visit! These are beautiful! Love this! So super creative! Thanks! I’m glad you liked them. I appreciate the visit. You are very welcome! Thanks for the visit! I am always looking for neat little ways to “upcycle” or repurpose stuff like this. This is great! I’m glad you liked it. Thanks for the visit! I appreciate it. Brilliant, I always wanted to have a go at this but couldn’t think of a way of getting around drilling through glass, I didn’t want to do that. Now you have shown a far safer way I will definately have a go, thank you so much for sharing. I’m so glad you found this helpful! Thank you so much for coming by. I appreciate the visit! That is unique and a great idea! I can’t imagine living with that hot weather…I do like our fall breaks but not below freezing for weeks like last winter! I am still not used to it. We’ve been down here a little over three years (from Colorado. Huge change!) and I still can’t believe it’s now time to put in corn for the fall. It’s been a big adjustment. I love your site! I get lost in the photos and your garden design. I was happy to see someone else who grows shiso! I love finding people who are on a similar path through the wilderness. I’m looking forward to reading through your blog. Thanks for coming by! I appreciate it. I have family in Chicago. Too cold and cloudy for me! I also like your name:-) crazygreenthumbs! These are actually some very creative and beautiful ideas – I might just try one of them myself. I’m glad you liked them! Thanks for stopping by, I appreciate the visit. I’m glad you like them! Thanks for coming by. I appreciate it! I’m glad you enjoyed it! Thanks for coming by. Great! I hope you enjoy yours as much as I have mine. Thanks for stopping by. I appreciate it! Thank you for the reblog! I appreciate it.